When you walk in the front door at McOmie Family Dentistry, most likely the first person you will see is Allie. She will greet you with a smile and call you by name in her friendly southern-lady way. Dental Assistant, Front Desk Administrator or Insurance Genius? Allie is a trained dental assistant, but these days she works at our front desk. She is a very hard-working, genuinely kind individual who spends her days helping people. She helps people who come into our dental office figure out many difficult problems such as insurance! To many of us, insurance is a complete puzzle that we can’t figure out without some help. Who do you turn to when you need help with dental insurance? It seems many people lean on Allie. She can then figure out what their dental benefits are and what the insurance will and won’t pay. This is no easy task, as anyone who has insurance can tell you. Rest assured Allie will help you maximize your dental insurance benefits. She is one of the people that answer the phone when you call our office, no automated machine answering the phone here. At our dental office, we pride ourselves on our customer service, and we can’t give excellent service having a machine answer the phone and taking 2 minutes of your time making you press buttons. Allie does an outstanding job at our front desk, everyone who meets her can’t help but love her. Dental knowledge is something that is needed to work at the front desk. You have to know procedures in the back and be able to code the dental procedures correctly to ensure efficient processing of dental claims. So to work at the front desk, you have to know everything that goes on in the office. You have to understand from the front to the back. Allie knows all of this. 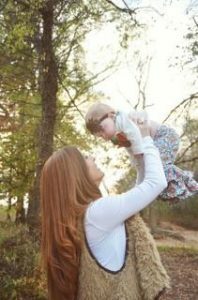 Allie and her daughter Madelynn. Allie and Scarlet at a health fair. 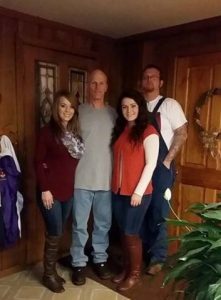 Allie, her father, sister and brother. Allie is from Dunlap, Tennessee. She was born and raised there and still calls it home. She graduated from Sequatchie High School. 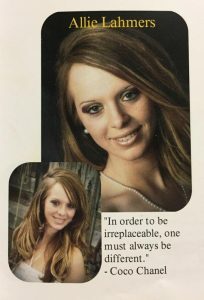 She then went to Miller-Motte for dental assisting and graduated before becoming employed at McOmie Family Dentistry. 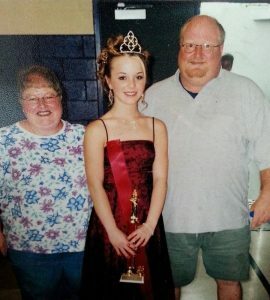 Before she was in high school, Allie did beauty pageants. 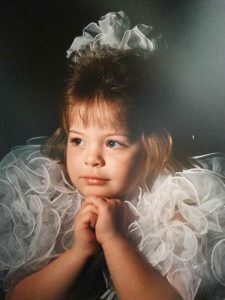 She competed in quite a few pageants and recalls fondly being able to ride on a float in the 4th of July parade in Dunlap when she was a kid. She won Teen Miss Fairest Of The Fair, Miss Children’s Miracle Network, and Miss Relay For Life to name a few. 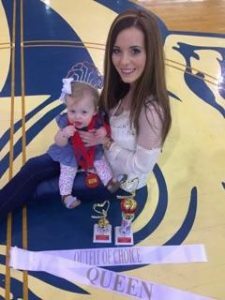 She loved doing pageants and her daughter, still in diapers, is following in her footsteps. While she was in junior high and high school, she played softball and volleyball. She played both shortstop and center field. 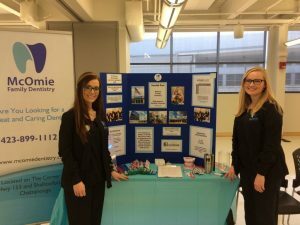 Allie came to McOmie Family Dentistry right out of school and learned front desk from the legendary long-time employee, Dorothy. Dorothy had worked at the front desk for 14 years and worked at the front desk of various dental offices about 20 years altogether. Allie had some big shoes to fill! When Dorothy retired, Allie was handed the reigns. She rose to the occasion and has done a wonderful job. How Do Her Co-Workers Describe Her? Kind, beautiful, caring, smart, and hard working are words her colleagues use to describe Allie. She is wonderful at her job and can balance many things at one time. Working the front desk of such a busy front office, there are many irons in the fire at all times. Keeping things straight is hard to do, and Allie excels at this. She is always pleasant and is just one of those people who seems to never be in a bad mood. She is always professional, even when she is extremely busy. She is part of the core of our office. 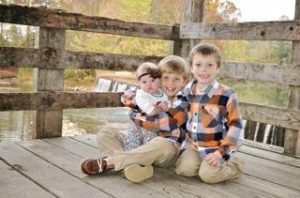 Allie’s children. 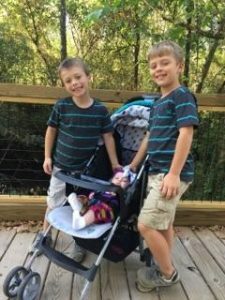 Proud brothers of their new little sister. The love of her life, her beautiful children. 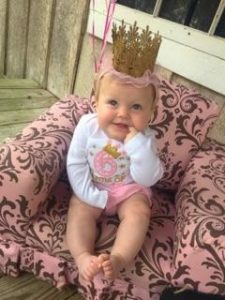 Her daughter won Queen at the pageant. Allie and Jeremy at a costume party. Her first job was as a car-hop at Sonic. 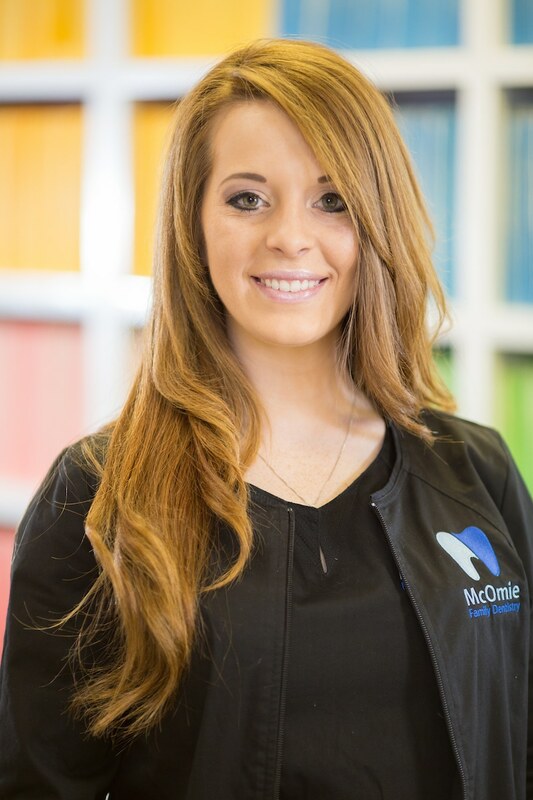 Before coming to McOmie Family Dentistry, her last job was as a receptionist at a car dealership. Least favorite thing is dealing with insurance companies on the telephone. 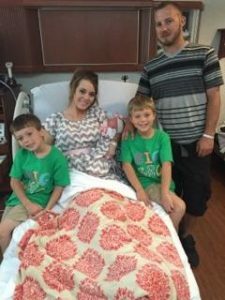 Has three kids: two boys and one girl. Science was her favorite subject. 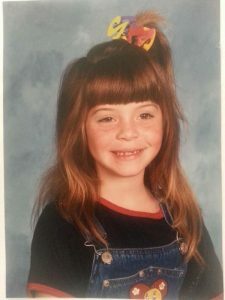 When she was a kid, she wanted to become a forensic scientist. Has never tried water skiing. Hit many home runs in softball. Her house burned down, not once but twice, as a child. She is a natural red head. Loves dressing her daughter up in cute clothes and giant bows. One of her pageant wins. What made you want to be a dental assistant? Seeing people without a smile leave the office with one. The confidence a new smile can give a person is amazing! It seriously changes everything about them. You see more confidence in them, and they have a happy zest about them after having their smile restored. I knew I wanted to be a part of having such a positive impact on people’s lives. What is your least favorite thing about your job? Dealing with insurance companies on the phone can be frustrating. I want to help our patients so much, and I know I can help them understand their dental benefits if the insurance company will just give me the information. When I am on the phone with an insurance company, and they put me on hold or won’t tell us information, it is frustrating because I am unable to help the person in the way I want. It is out of my control, and I don’t like that. I want to help people and give them immediate answers. Sometimes that isn’t possible because of the insurance company. I find that frustrating for everyone. Favorite thing about your job? Interacting with patients and seeing their confidence improve. I have seen some amazing transformations. One that comes to mind is a guy who was thrown from a lift 80 feet in the air. He had been through many surgeries by the time he got to us. His cranio-facial surgery was 9 hours long. As you can imagine, his teeth were severely damaged from the accident. By the time we finished with him, he had this broad, beautiful smile and looked awesome! His wife and family were as happy as he was. I saw him change from looking like a victim of an accident to becoming a confident person again. It was great! Seeing genuine happiness is an amazing thing and getting to be part of helping someone achieve that is fantastic. Facebook is her favorite social media. Blowing your nose at the dinner table is her pet peeve. Has competed in a bikini contest. Watching her boys play sports tops the list of her favorite weekend activities. Sweets, especially chocolate, is her guilty pleasure. Destin and Gatlinburg top her list of favorite places to visit. Pizza is her least favorite food. Will only buy name brand cosmetics. Ohio and Florida are the furthest from Tennessee she has been. Reading is her favorite hobby. Italian food is her favorite food. Funny as her least favorite food is pizza. Being in a car crash is the scariest thing she has ever done. Best vacation is Disney World with the kids. Do you have a funny story you will tell us? I was playing in a softball tournament when I was younger. In between games, we were playing on the playground. I flew down the slide and landed on my bottom very hard. I was afraid to tell my parents how much I was hurting. During our next game, my first at-bat I hit a home run and ran the bases. After I had run the bases, I was in so much pain I had to come clean about why I was hurting. I left the game and went to the emergency room where I was diagnosed with a broken tail bone. So embarrassing! Halloween is always fun at our office. 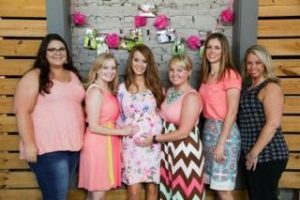 Morgan, Scarlet, Allie, Savannah, Kristin at Allie’s baby shower. What do you like about working at this dental office? I really love the people I work with. They truly are my second family. We hang out even when we are not at work. If I ever need anything, they are a phone call away. We all care about each other. I think the chemistry shows. When you come in the office, and everyone is happy and gets along, it is apparent. This is the only office I have ever seen where everyone does get along. 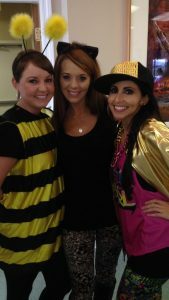 My co-workers are like my sisters, and I love them. This is one of the things that makes our office unique. The quality and the caring go hand in hand. When everyone cares about what is going on at the office and wants the quality to be top-notch, we are all pulling in the same direction. We will help each other. This gives the patient an excellent experience. Leaving work knowing that we did something special for someone each day is great! We work hard, but the rewards of seeing what we do are worth it. It isn’t just a job to any of us; it is a passion for excellence. 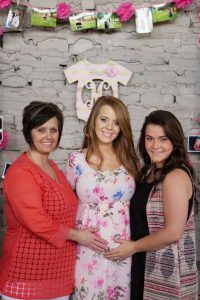 We love Allie, and having her part of our staff is awesome! You can see from reading this what makes her so special. We are very happy to have her as part of our team and to be able to work with her each day. She works very hard to make sure each and every patient experience is as good as possible. She has the ability to unravel a problem and the talent to make it look easy. She is awesome. So next time you come in make sure you say hello and tell her you read the blog post about her.